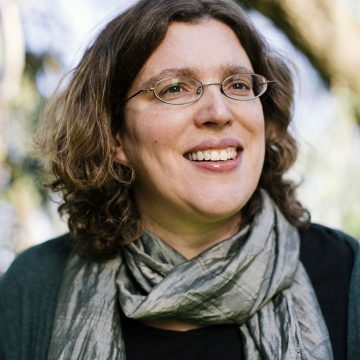 Canadian-born, Scotland-based composer Emily Doolittle grew up in Halifax Nova Scotia and was educated at Dalhousie University, the Koninklijk Conservatorium in the Hague, Indiana University and Princeton University. From 2008-2015 she was Assistant/Associate Professor of Composition and Theory at Cornish College of the Arts. She now lives in Glasgow, UK, where she is an Athenaeum Research Fellow at the Royal Conservatoire of Scotland. Emily Doolittle has an ongoing research interest in zoomusicology, the study of the relationship between human music and animal songs. She recently spent 3 months as composer-in-residence at the Max Planck Institute for Ornithology in Seewiesen, Germany. Other interests include the traditional music of various cultures, community music-making, and music as a vehicle for social change. She was awarded a 2016 Opera America Discovery Grant, as well as funding from the Hinrichsen Foundation and the Canada Council of the Arts, for the development of her chamber opera Jan Tait and the Bear, which was premiered by Ensemble Thing, with Alan McHugh, Catherine Backhouse, and Brian McBride, conducted by Tom Butler and directed by Stasi Schaeffer, at the Centre for Contemporary Arts in Glasgow. Upcoming projects include commissions from the Cherry Street Duo and the Fair Trade String Trio, research on grey seal vocalizations at St Andrews University and a new seal-inspired piece for the St Andrews New Music Ensemble conducted by Bede Williams, and a set of new spring wassailing songs written and researched with the support of a Canada Council for the Arts Grant to Professionals.